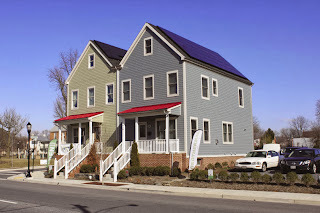 Here is an article from the Frederick News-Post in Frederick, MD printed on 12/2/13 about a builder that was written up by all the so-called Green websites and given the stamp of approval by just about everyone. This is not a story of green being a bad way to build, rather its a story of how a new home builder that received investor money now appears to be circling the drain. Nexus EnergyHomes, located in Stevensville, MD received the EnergyValue Housing Award for 2012 Builder of the Year. MD Gov. Martin O’Malley recognized the company’s innovation in his State of the State speech this year. Now, with all eyes set on it, the project is stalling. The company grew too fast and was never properly capitalized from the beginning, Murphy said. Nexus is also developing communities in Ijamsville, Jefferson, Upper Marlboro and North Charleston, S.C. The company has outstanding bills, Murphy said. And homeowners have issues with warranties and sales that they feel the company is not addressing fast enough, he said. CLICK HERE to read the entire Frederick News-Post article.